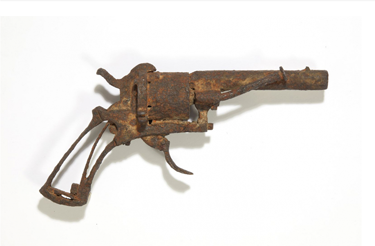 The 7mm Belgian pinfire revolver that might have shot van Gogh. have an important historical connection. On the other hand, some drunken clochard might simply have lost it sleeping in the field. Any shmoe with a spare $25-$100 million dollars can land themselves an original Vincent Van Gogh painting, but this June, only one lucky bidder can go home with a singular piece of art history: the gun that was allegedly used by the eccentric painter to kill himself. As reported by the Associated Press, a 7mm pocket revolver found in a field in the northern French village of Auvers-sur-Oise — where Van Gogh is believed to have shot himself in the chest on July 27, 1890 — will go up for auction in Paris at the Drouot auction center, on June 19. The painter died two days later of his apparently self-inflicted injuries — although another recent theory is that Van Gogh did not inflict this wound himself. Either way, the gun was included in a 2016 exhibition at the Van Gogh Museum in Amsterdam, On the Verge of Insanity: Van Gogh and his Illness, which deals with multiple aspects of the painter’s notoriously troubled mental health, and is expected to fetch €40,000–60,000 (~$45,000–67,000) at auction. It certainly represents a unique offering for obsessive Van Gogh fans, gun collectors, and historical true crime enthusiasts. the Archives of Never Yet Melted in the 'Drouot Auction Center' Category.